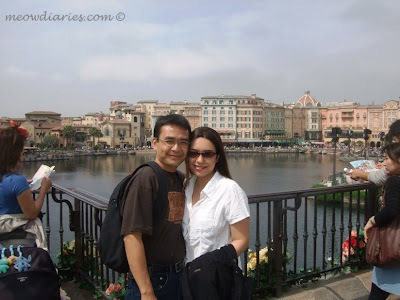 My fondest memory of our recent Japan holiday was definitely visiting DisneySea so if you're planning an upcoming vacation, why not make Tokyo your destination? It's a great time to plan a vacation especially with all the Cheap Flights, Hotels and Last minute holidays you can find online. ULookUBook for instance offers cheap holidays, discount hotels and last minute flights to thousands of bargain holiday destinations worldwide. Whatever your location and vacation needs, this travel site will ensure all your desires are quickly and satisfactorily met. 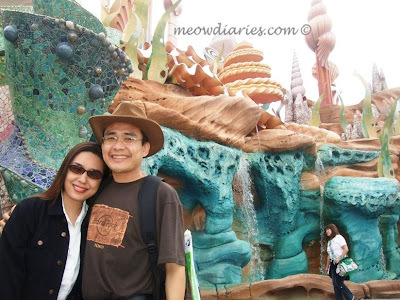 If you're like me and tend to be fickle in almost all matters including selecting the perfect vacation destination, worry not as travel guides are also available. You will be able to find detailed tourist information to help you decide your destination. Find out more about the world's most popular holiday countries and resorts right here. 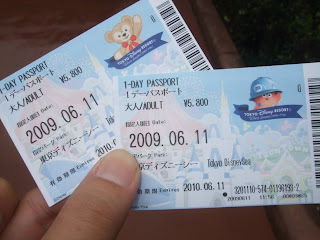 To get you in the holiday mood, let's enjoy a day with Master and B at DisneySea, Tokyo shall we? 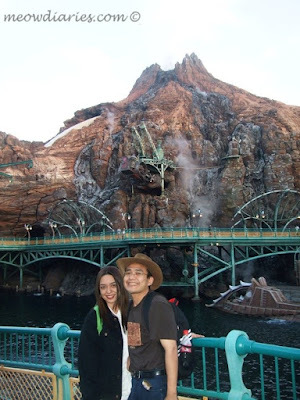 We left our hotel early in the morning and spent an entire day at DisneySea. It was a weekday so we were not expecting a lot of visitors. 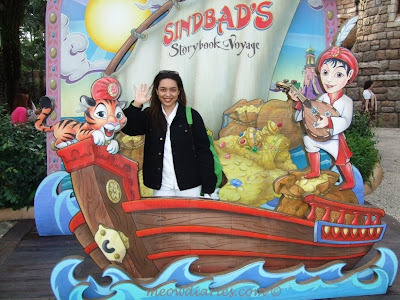 As the day unfolded; the crowd grew bigger and the weather warmer and we found ourselves totally caught up in the excitement and joy one can only find in the magical world of DisneySea! The theme was Spring Carnival and the view was breathtaking. Pretty flowers were in bloom everywhere and oh so many colours! 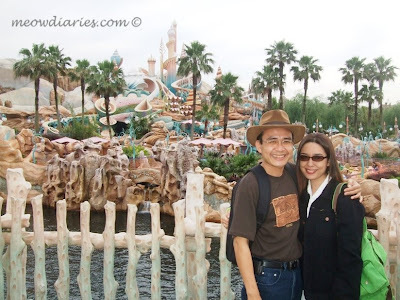 Exciting attractions were in abundance and we were initially lost but soon found our bearings and began exploring all the magnificent seven theme ports namely the American Waterfront, Mediterranean Harbour, Mysterious Island, Mermaid lagoon, Arabian Coast, Lost River Delta and Port Discovery. 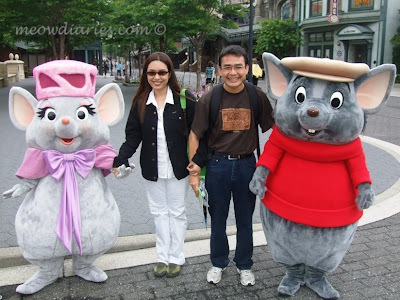 Visiting DisneySea would be incomplete if we didn't meet some of the cool Disney characters so we made sure we pounced on whoever we saw walking around. 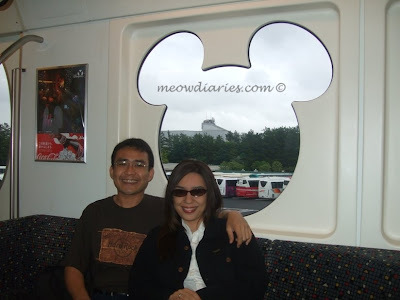 Donald Duck was busy doing his dance so we made Minnie Mouse our first target! Doesn't she look pretty? Cruella de Vil was an interesting sight to watch. True to her character she was strutting around haughtily; sneering at visitors who dared ask for a picture. When I thanked her for the picture, she retorted with an evil smile and said "The pleasure is all YOURS dah-ling" before sauntering away! 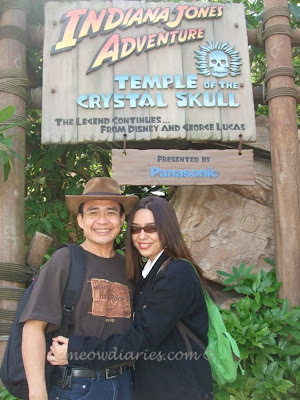 Aside from the Tower of Terror free-fall ride I so bravely went on without B, we took a fun exciting ride on the Temple of the Crystal Skull. The ride took us down the path of Dr. Indiana Jones in a harrowing, life-or-death quest for the legendary Fountain of Youth. It was interesting and fun but definitely nowhere near as terrifying as the Tower of Terror! Beware of the erupting volcano! 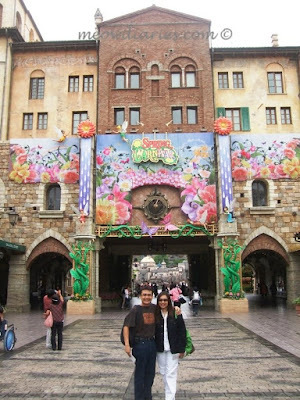 Spending our last day at DisneySea made a nice memorable ending to our 6-day vacation in Tokyo. 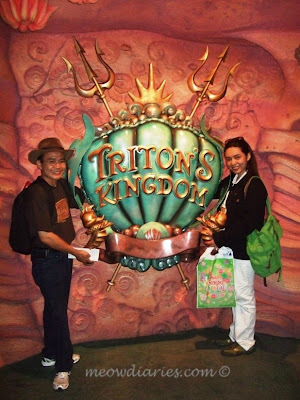 It took us the entire day and evening to cover all seven ports but the experience was worth every minute. We took so many pictures and bought so many souvenirs and came home totally exhausted but deliriously content. 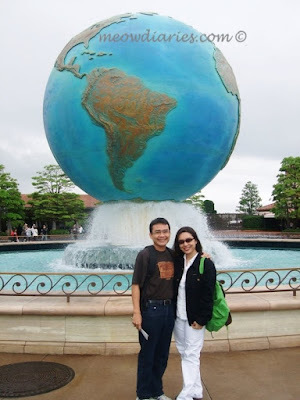 I have to say this Tokyo vacation was even better than our first one and I'd like to thank my darling B for making this vacation come true for me. I enjoyed every minute of our time together and now, beautiful Tokyo remains close to my heart as I await our next amazing adventure. If you're like me and tend to be fickle in almost all maters.. you mean matters? Wah!! I love all the pictures dearie... so enjoyable.. now I feel like I want to go edi..
Eh you edi.. SW lah... no need to BD lah.. so lawa edi lah.. where all white pun tak nampak besar.. so gorgeous edi lah.. I love that guy nya misai.. melenting gitu.. lol!!! eh how much tu 5800 yen?? Oh thank you LJ! Lemme fix it now! Can I have LJL here sweetie.. thanks so much!! Muahss!! 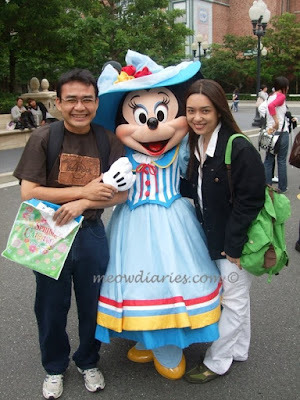 Minnie Mouse ramai org nak ambik gambar, so had to wait and “push” our way through lol! The chef u mean LJ? hah ha yeah la see my hair tersangkut there lol! 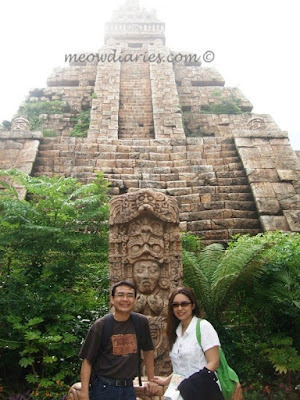 Oh patutla nampak mcm Indiana Jones' hat! :):) Yeehah!! Wah RM214 for one ticket. wah expensive eh..
Hehe.. eleh.. ada gambar tu yg tak der jacket.. ok jer.. cantik lah you. Hehe.. nak gi vacation. Back to SG>. Lol!.. I need retail therapy! 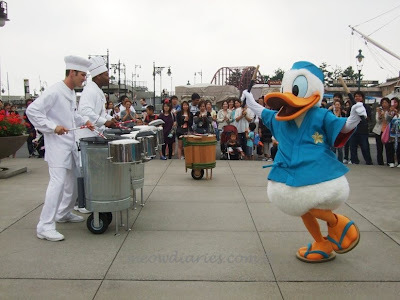 looks like Disneysea is a wonderful place to visit just like other Disney places. those pics are all fabulous. 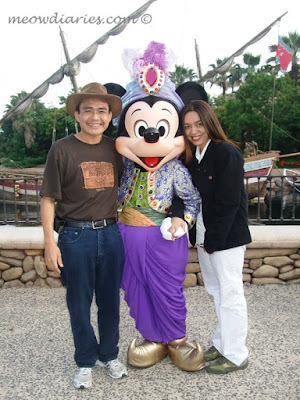 how lucky of you to take pics with some cool disney characters. so jealous of you! whoaa!!! bestnya!!!! 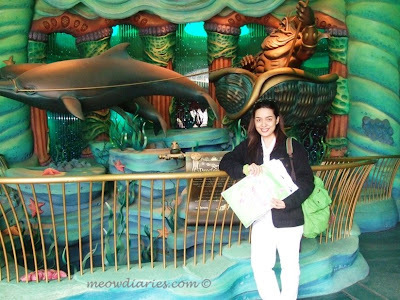 thanks for sharing the pictures, marzie! 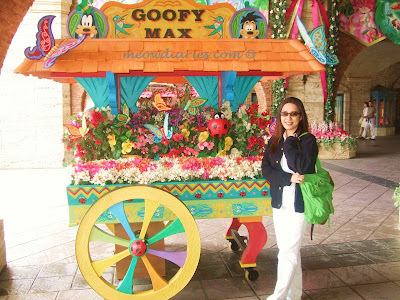 now can berangan one day to go to disney world bawak yassin!!! Woof Marzie! What an amazing place! 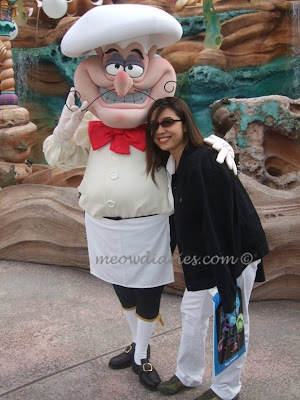 So many cool pics with Disney characters, that was sure and awesome trip! Wow, meow!!! I like linking love, thanks so much, dear! Wow! You guys look so happy together! Hehe..
You both seemed having fun there. pharmacy xpert pharmacy 90048organic pharmacy ?????? ??? pharmacy in canada pharmacy burgercvs pharmacy ???????? ?